Yoshimura, who took charge of India operations in January, has worked in China for Toyota in the past. “I was playing golf in Beijing once, and I lost the ball in the air because of the fog,” he said. Toyota is offering self-charging hybrid vehicles that could minimise the emission by 48 per cent, and carbondioxide by 28 per cent, he said. The company launched the new Camry Hybrid at an ex-showroom price of Rs 36.95 lakh on Friday. Calling it a hybrid electric vehicle, he said it would not need a charging station. "It is not zero-emission unfortunately. But we have a technology in the fuel cell to bring this to zero in the future. At the moment, we should introduce self-charging hybrid cars for India. It will reduce import of fossil fuel and forex use." In the long-term, the company aims to bring in a variety of technologies that will be based on the stable regulation and taxation. The company has partnered Suzuki to introduce electric vehicles in the Indian market. Yoshimura said the taxation system in India was 'very complicated'. Camry Hybrid, which was eligible for certain fiscal incentives before the rollout of GST, is now charged at an additional cess of 15 per cent, besides the 28 per cent GST. “Personally, I feel it should be linked to emissions. If the emission is lower, the consumer should get the vehicle at a lower tax. The car makers can then easily invest in new technologies. If regulations change frequently, it will impact investment in future technologies,” he said. The high tax on Camry Hybrid has halved its sales to 210 units in the first eight months of FY19, against 437 units in corresponding period of FY18. 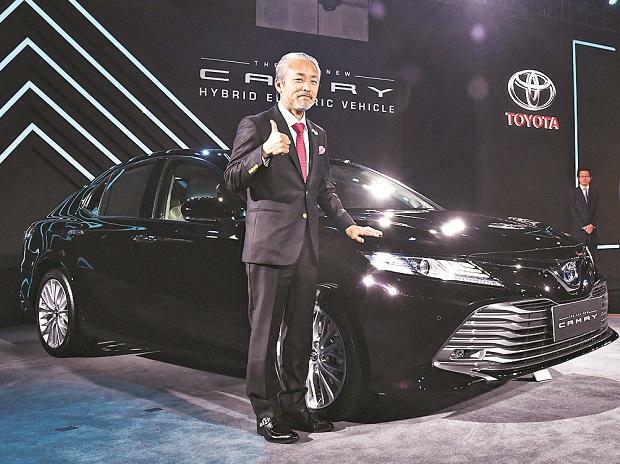 N Raja, the company's deputy managing director, said he was hopeful that Camry Hybrid's sales would rise to a pre-GST level of hundred units a month. India, world's fourth-largest market in terms of passenger vehicle production, is a small contributor in Toyota's global sales. Of the 10.55 million units sold globally by the Japanese auto major in 2018, India brought just about 151,400 units, growing over eight per cent. But Yoshimura said India would turn a key market. "In Toyota's global sales volume, India was 11th in 2017, and it has moved up to 10th in 2018. We foresee India easily moving up to the top three position in the future. We need to satisfy the consumers first and numbers will follow,” said Yoshimura. In India, Toyota heavily banks on a diesel-vehicle portfolio, comprising primarily Innova and Fortuner. These two models bring more than 60 per cent of the company's sales, and continue to see a rise in volume in spite of the declining popularity of diesel-run vehicles amid adverse regulations. “Diesel is not as good as petrol. Technology may be able to improve that. Globally, diesel is decreasing for sure. We should be carefully monitoring the shift,” said Yoshimura.